Background: Favorable quality of recovery from general anesthesia in neurosurgical patients is an important goal for anesthesiologists. Dexmedetomidine is an emerging anesthetic adjuvant characterized by a stable hemodynamic recovery period, and neither its sedative nor analgesic effects influence evaluation of neurological function. We hypothesize that a bolus injection of low-dose dexmedetomidine during general anesthesia within minutes before the end of surgery in patients undergoing craniotomy can improve the quality of recovery from general anesthesia, thereby benefitting the evaluation of early-stage neurological function after surgery. Methods/Design: Patients with supratentorial tumors who have undergone craniotomy under general anesthesia at the Department of Neurosurgery, First Affiliated Hospital of China Medical University are included in this randomized controlled trial. A sample size of 150 patients is needed. Patients in the experimental group are randomly assigned to receive intravenous bolus injection of low- and medium-dose dexmedetomidine (0.4 and 0.8 ΅g/kg, respectively). Patients in the control group receive equal doses of physiological saline. The primary outcome of the study is the quality of recovery from general anesthesia, including awakening time, degree of sedation, spontaneous breathing recovery time, and coughing and bucking at the time of tracheal extubation. Secondary outcomes include postoperative analgesic effects, hemodynamic indices, anesthesia time, operation time, and neurological function assessment. Discussion: The results from this trial will provide optimal evidence for intravenous bolus injections of dexmedetomidine at a dose that can improve the quality of recovery from general anesthesia after craniotomy for supratentorial tumors. Trial registration: ClinicalTrails.gov identifier: NCT02007798; registered on 6 December 2013. Rapid awakening, a stable blood pressure and heart rate, absent or mild pain, and tolerance of endotracheal intubation can avoid the increased intracranial pressure, elevated blood pressure, and rapid heart rate caused by choking, suffocation, and agitation and can reduce postoperative cerebral edema and the risk of bleeding. Additionally, excellent recovery from anesthesia allows surgeons to evaluate postoperative patients' neurologic function in a timely manner (Ren et al., 2015a). Many techniques and drugs have been used to improve the quality of the recovery period, but each has flaws. Dexmedetomidine (Dex) is an emerging anesthetic adjuvant characterized by a stable hemodynamic recovery period, and neither its sedative nor analgesic effects influence the evaluation of neurological function. Therefore, use of this drug can help surgeons to evaluate patients' neurologic function in the early stage after surgery (Al-Zaben et al., 2015; Sokhal et al., 2015; Volkov et al., 2015). Dex is a central α2-adrenoceptor agonist with the chemical name (S)-4-[1-(2,3-dimethylphenyl)ethyl]-3H-imidazole. It has a structure and pharmacological activity similar to those of clonidine. Both Dex and clonidine are α2-adrenoceptor agonists, but Dex is 10-fold more effective than clonidine (Li et al., 2015). Dex was initially developed as a blood pressure-lowering agent and, similarly to clonidine, can lower both the blood pressure and heart rate. It also has a strong anesthetic effect (Man et al., 2015). Dex is currently used for systemic anesthesia, anesthetic monitoring, and conscious sedation in intensive care settings. Dex has sedative, sleep-producing, analgesic, and anxiolytic properties, and it is superior to other sedative drugs because it induces cooperative sedation and no respiratory depression (John et al., 2015). When perceiving a nociceptive stimulus, the body produces stress responses characterized by an increased heart rate and blood pressure (Song et al., 2015). Dex can, to a large extent, inhibit the stress responses of the cardiovascular system caused by tracheal intubation and extubation and improve the outcomes of tracheal intubation and extubation (Sun et al., 2012). General anesthetics should make patients lose consciousness, prevent them from perceiving pain, and inhibit harmful stimulus-induced intraoperative stress responses such as hypertension and tachycardia (Ren et al., 2015b). Therefore, one of main responsibilities of anesthetic physicians is to maintain stable cardiovascular functions in their patients (Bakri et al., 2015). The most common methods used to control excessive stress responses are to increase the concentration of inhaled anesthetics and increase the dose of opioid medications. There is evidence that Dex for general anesthesia can greatly lower tracheal intubation-induced cardiovascular stress responses (Wu et al., 2007; Ulsal et al., 2012). The clinically recommended loading dose of Dex is 1.0 μg/kg, the time to onset is appropriately 15 minutes, and the elimination half-life is appropriately 2 hours (Gerlach et al., 2009). However, an excessively high one-time dose or too-rapid infusion of Dex likely lowers the heart rate and blood pressure. Therefore, we hypothesize that intravenous bolus injections of low-dose (0.4 μg/kg) Dex during anesthesia within minutes before the end of surgery in patients undergoing craniotomy can improve the quality of recovery from general anesthesia and thereby benefit the evaluation of early-stage neurological function after surgery. This study is being conducted at the Department of Neurosurgery, First Hospital of China Medical University, China. Patients with supratentorial tumors who undergo craniotomy under general anesthesia from December 2013 to December 2014 at the Department of Neurosurgery, First Affiliated Hospital of China Medical University, China and who fulfill the following criteria are eligible. Preoperative magnetic resonance imaging diagnosis of a supratentorial space-occupying lesion (glioma, meningioma, or neurofibroma) and tumor diameter of ≤ 40 mm. Study termination by researchers from a medical perspective or by the patient himself or herself. The subjects are allocated into groups using a computer-based simple randomization method, then randomly coded and provided with a corresponding emergency envelope. Blind codes are preserved by the drug administer. The subjects are randomly assigned to three groups (n = 50) and receive 0.4 or 0.8 μg/kg of Dex (200 μg per 2 mL ampoule; Chinese medicine permission No. H20090248; Jiangsu Hengrui Medicine Co., Ltd., China) (low-dose and middle-dose Dex groups) or an equal dose of physiological saline (100 mL/bag; control group) via intravenous administration. All drugs are diluted with physiological saline to 20 mL and infused within 20 minutes through the use of an injection pump. The researchers performing the experiments or measuring the results and all of the patients are blinded to the group assignments to avoid measurement bias. Drugs/placebos are provided by Central Pharmacy, First Hospital of China Medical University, China. Pharmacists prepare the drugs according to the assigned group and planned protocol as follows: 2 mL of 100 μg/mL Dex stock solutions are added to 98 mL of physiological saline to prepare 2 μg/mL Dex. Drugs at the doses required according to the patient's body weight (kg) and grouping are diluted with physiological saline to 20 mL for use. For patients in the control group, 20 mL of physiological saline is used. All drugs or physiological saline are infused at the speed of 2 mL/min within 10 minutes. The injectors are then tagged based on the patient's code and preserved by the drug administrators for use. The above indices are recorded by the PACU nurses, who are blinded to the study protocol and group assignments. The trial outcome measurement schedule is shown in [Table 1]. A trial protocol flow chart is shown in [Figure 1]. Figure 1: Trial protocol flow chart. When the mean arterial pressure is > 90 mmHg (1 mmHg = 0.133 kPa) during maintenance of anesthesia, the dose of anesthetic drugs is increased; i.e., the inhalation concentration of sevoflurane, propofol infusion dose, and/or remifentanil infusion dose is increased. If the effect is still not satisfactory, a single dose of nicardipine (0.5-1.0 mg) is intravenously infused. When the mean arterial pressure is < 60 mmHg, a single intravenous injection of ephedrine (5-10 mg) is added; the mean arterial pressure can also be adjusted by fluid replacement and reduction of the anesthetic doses (such as the inhalation concentration of sevoflurane, propofol infusion dose, and/or remifentanil infusion dose). If the effect is still not satisfactory, continuous infusion of 2% norepinephrine is recommended to maintain blood pressure within the target range. When the heart rate is > 90 beats/min or ST-T segment abnormalities on electrocardiogram appeared during maintenance of anesthesia, a single dose of 5 to 10 mg of esmolol is given intravenously; meanwhile, fluid replacement is also recommended. When the heart rate is < 45 beats/min, a single dose of 0.3 to 0.5 mg atropine is infused intravenously. If the effect is not satisfactory, repeated administrations are performed until the maximum cumulative amount of 2 mg is reached. Isoproterenol (1 mg per 500 mL) is then intravenously given, and the infusion speed is adjusted according to the patient's heart rate. If the RASS score is ≥ 2 during emergence from general anesthesia, a bolus injection of propofol (1.5-2.5 mg/kg) is applied when necessary. If the patient exhibits chills upon emergence from general anesthesia, an intravenous injection of tramadol hydrochloride (0.1 g) is given slowly for heat preservation. If nausea and vomiting appear, an intravenous injection of tropisetron hydrochloride (Xinbei, 5 mg) is given. If the VNRS score is > 6 during emergence from anesthesia, a single bolus injection of sufentanil (5 μg) is given. If pain is not alleviated, this injection is repeated after 5 minutes; the total dose does not exceed 10 μg (Kim et al., 2012). During the trial, any adverse events including abnormal laboratory examination findings will be carefully inquired and investigated. All adverse events will be assessed with consideration of the nature, severity, and correlation with drugs, and the assessment results will be strictly entered in the medical records. The intensity or severity of adverse events will be classified into the following three grades. Mild: Transient hypertension, lowered heart rate (with no need for interventions because the patient is in the anesthetic state). Moderate: Sinus bradycardia, escape beat (an intravenous infusion of 0.3-1.0 mg atropine), and complicated hypotension (an intravenous bolus of 10-15 mg ephedrine). Severe: Sinus arrest (cardiopulmonary resuscitation when necessary). Correlations between adverse events and drug use will be categorized as positively correlated, much likely correlated, likely correlated, likely unrelated, or unrelated. The incidence rate of adverse events will be calculated by summing positively correlated, much likely correlated, and likely correlated adverse events. Management of adverse events during and after the trial will be performed as follows. The turnover of all adverse events will be followed up and recorded, and patients who withdraw from the experiments because of adverse events will be followed up until complete resolution of the adverse events. Whether the adverse events are related to drug use will be determined, and related supporting evidence will be provided. Severe adverse events including hospitalization, prolonged hospital stay, disablement, limited work capacity, life-threatening events, death, and congenital malformations will be reported to the sponsor within 24 hours and recorded. When severe adverse events occur, the researcher in charge will open the group assignment envelope and the reasons for and date regarding the emergency break will be recorded in the medical record. The researcher in charge will then determine whether this patient will drop out of the trial. The medical records acquired from the trial will be collected by staff members who will ensure that the records are high-quality and accurate. The filled case report forms will also be retrieved by these staff members. After confirmation, the correct information will be input into the database. Medical records will be disclosed for the first time. These medical records will be divided into the aforementioned groups and processed by the trial director. All data will be statistically calculated using SAS9.0 software. Numeration data will be expressed as percentages and measurement data as the mean ± SD. The chi-square test will be used to compare differences among numeration data, and analysis of variance and Tukey's post hoc test will be used to compare differences among measurement data. A P level of < 0.05 will be considered statistically significant and a level of < 0.01 highly significant. After statistical analysis, the medical records will be disclosed for the second time. Two Dex groups and one control group will be designated. All records will be kept in a secure, locked storage area with limited access for later review by appropriate trial staff only. According to China Drug Clinical Trial Management Specification, all records will be preserved for at least 5 years. Two researchers in charge and five staff members will perform the trial. Each step will be strictly performed according to the trial protocol. One researcher will be designated for quality control. Each step of quality control of measured outcomes will be performed according to the standard operating procedure and quality control procedure. SI units will be used for each examination item. The trial reports will include the date, examined items, results, and range of normal values. Written approval of the trial protocol, medical reports, and signed informed consent will be received from the Ethics Committee, First Hospital of China Medical University, China. The benefits and risks of participation in the trial will be explained to each patient, legal deputy, or witness by the sponsors or their designee, and written informed consent will be obtained before the trial. The informed consent with the signature of the patient, legal deputy, and person who explained the benefits or risks will be preserved by the researchers. The trial will be conducted in accordance with the Declaration of Helsinki. There is evidence that a bolus injection of Dex (0.4 μg/kg) within 30 minutes after induced anesthesia stabilizes the heart rate and blood pressure during emergence from general anesthesia after thyroid gland surgery and shortens the awakening time and extubation time (Zhao et al., 2014). However, related studies involving brain surgery have not been reported. A favorable quality of recovery from general anesthesia in neurosurgical patients is an important goal for anesthesiologists. In this trial, a bolus intravenous injection of low-dose (0.4 μg/kg) Dex in patients undergoing craniotomy under general anesthesia is expected to reduce the emergency responses caused by the harmful operation, maintain stable cardiovascular function, and reduce adverse events (such as low heart rate and blood pressure) during emergence from general anesthesia. It is also expected to provide benefits for early recovery from anesthesia and subsequent assessment of neurological function recovery. This trial will be strictly performed in a double-blinded, randomized, and controlled manner, and the number of clinical cases should accumulate to planned quantitation. There are no obvious differences in the patients' general data between the two study groups, and therefore they are well comparable. Placebo as a control is more conducive to assessment of the effects of drugs used. The trial results will provide more insight into whether rational use of Dex before the end of surgery for supratentorial tumors can improve the quality of recovery from general anesthesia. Data management and analysis at time of submission. YY conceived and designed this trial protocol and wrote the paper. PL revised the paper. Both authors approved the final version of this paper. Andrzejowski J, Francis G (2002) The efficacy of lidocaine administered Andrzejowski J, Francis G (2002) The efficacy of lidocaine administered via the LITA tracheal tube in attenuating the extubation response in beta-blocked patients following craniotomy. Anaesthesia 57:399-401. Al-Zaben KR, Qudaisat IY, Abu-Halaweh SA, Al-Ghanem SM, Al-Mustafa MM, Alja'bari AN, Al-Momani HM (2015) Comparison of caudal bupivacaine alone with bupivacaine plus two doses of dexmedetomidine for postoperative analgesia in pediatric patients undergoing infra-umbilical surgery: a randomized controlled double-blinded study. Paediatr Anaesth 25:883-890. Bakri MH, Ismail EA, Ibrahim A (2015) Comparison of dexmedetomidine and dexamethasone for prevention of postoperative nausea and vomiting after laparoscopic cholecystectomy. Korean J Anesthesiol 68:254-260. Gerlach AT, Murphy CV, Dasta JF (2009) An updated focused review of dexmedetomidine in adults. Ann Pharmacother 43:2064-2074. Hassani E, Mahoori A, Sane S, Tolumehr A (2015) Comparison the effects of paracetamol with sufentanil infusion on postoperative pain control after craniotomy in patients with brain tumor. Adv Biomed Res 4:64. John S, Somal J, Thebo U, Hussain MS, Farag E, Dupler S, Gomes J (2015) Safety and hemodynamic profile of propofol and dexmedetomidine anesthesia during intra-arterial acute stroke therapy. J Stroke Cerebrovasc Dis doi: 10.1016/j.jstrokecerebrovasdis.2015.06.041. Kim HJ, Kim DK, Kim HY, Kim JK, Choi SW (2015) Risk factors of emergence agitation in adults undergoing general anesthesia for nasal surgery. Clin Exp Otorhinolaryngol 8:46-51. Kim YJ, Lee GY, Kim DY, Kim CH, Baik HJ, Heo S (2012) Dexamathasone added to levobupivacaine improves postoperative analgesia in ultrasound guided interscalene brachial plexus blockade for arthroscopic shoulder surgery. Korean J Anesthesiol 62:130-134. Li B, Li Y, Tian S, Wang H, Wu H, Zhang A, Gao C (2015) Anti-inflammatory effects of perioperative dexmedetomidine administered as an adjunct to general anesthesia: a meta-analysis. Sci Rep 5:12342. Li R, Xu X, Wu XM, Xiong LZ, Guo QL, Lian QQ, He XH, Zhang Y, Qing EM, Zuo MZ, Chen YQ, Chen GZ, Li SY, Leng YF, Shi C, Huang XQ, Xu MX, Shi JH, Meng FM, Ouyang W, et al. (2013) Effect of dexmedetomidine on responses to endotracheal extubation during recovery from general anesthesia in patients with hypertension a multicenter, randomized, blind, placebo-controlled clinical trial.Zhonghua Mazuixue Zazhi 33:397-401. Man Y, Guo Z, Cao J, Mi W (2015) Efficacy of perioperative dexmedetomidine in postoperative neurocognitive function: a meta-analysis. Clin Exp Pharmacol Physiol 42:837-842. Rao AK, Gurajala I, Gopinath R (2015) Comparison of electroencephalogram entropy versus loss of verbal response to determine the requirement of propofol for induction of general anaesthesia. Indian J Anaesth 59:348-352. Ren C, Chi M, Zhang Y, Zhang Z, Qi F, Liu Z (2015a) Dexmedetomidine in postoperative analgesia in patients undergoing hysterectomy: a CONSORT-prospective, randomized, controlled trial. Medicine (Baltimore) 94:e1348. Ren C, Chi M, Zhang Y, Zhang Z, Qi F, Liu Z (2015b) Effect of intraoperative and postoperative infusion of dexmedetomidine on the quality of postoperative analgesia in highly nicotine-dependent patients after thoracic surgery: a CONSORT-prospective, randomized, controlled trial. Medicine (Baltimore) 94:e1329. 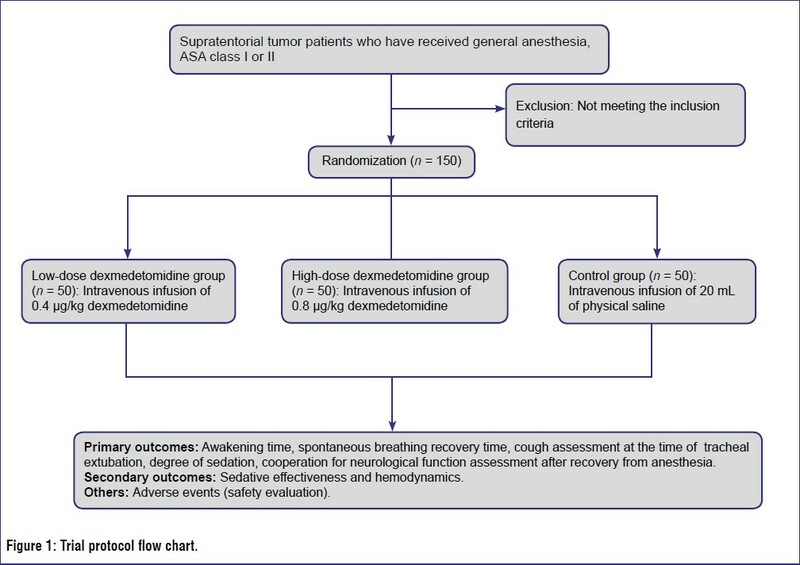 Sluga M, Ummenhofer W, Studer W, Siegemund M, Marsch SC (2005) Rocuronium versus succinylcholine for rapid sequence induction of anesthesia and endotracheal intubation: a prospective, randomized trial in emergent cases. Anesth Analg 101:1356-1361. 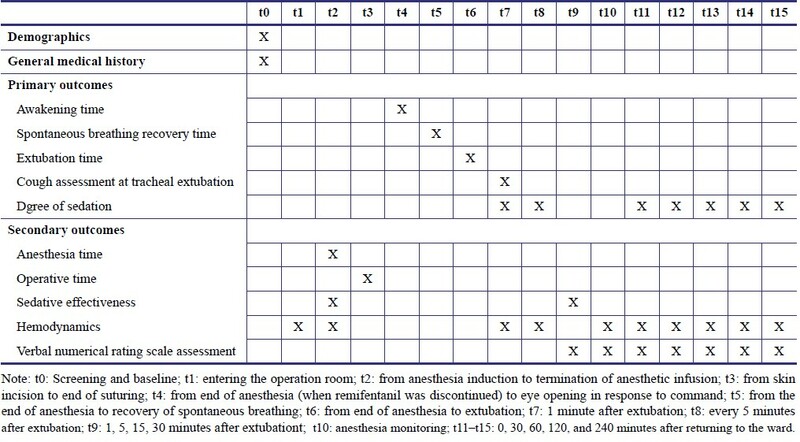 Sokhal N, Rath GP, Chaturvedi A, Dash HH, Bithal PK, Chandra PS (2015) Anaesthesia for awake craniotomy: a retrospective study of 54 cases. Indian J Anaesth 59:300-305. Song Y, Shim JK, Song JW, Kim EK, Kwak YL (2015) Dexmedetomidine added to an opioid-based analgesic regimen for the prevention of postoperative nausea and vomiting in highly susceptible patients: a prospective, randomised controlled trial. Eur J Anaesthesiol doi: 10.1097/eja.0000000000000327. Sun B, Li N, Qiang G, Zhang GM (2011)Effects of dexmedetomidine on the stress reaction of patients in perioperative period under intravenous-inhalation anesthesia. Shanxi Yike Daxue Xuebao 42:847-849. Uysal HY, Tezer E, Türkoðlu M, Aslanargun P, Baºar H (2012) The effects of dexmedetomidine on hemodynamic responses to tracheal ntubation in hypertensive patients: A comparison with esmolol and sufentanyl. J Res Med Sci 17:22-31. Volkov PA, Churadze BT, Sevalkin SA, Volkova YN, Guryanov VA (2015) Dexmedetomidine as a part of analgesic component of general anesthesia for laparoscopic operations. Anesteziol Reanimatol 60:4-8. Wu XM, Xu X, Wang JK, Wang KP, Xue ZG, Miao CH, Deng XM, Ai DB, Yu H (2007) Efficacy and safety of intravenous dexmedetomidine as a adjunt to general anesthesia. Zhonghua Mazuixue Zazhi 27:773-776. Zhao XC, Tong DY, Long B, Wu XY (2014) Effects of different doses of dexmedetomidine on the recovery quality from general anesthesia undergoing thyroidectomy. Zhonghua Weizhongbing Jijiu Yixue 26:239-243.